2016 Azimut 54 Flybridge that was custom ordered and loaded with equipment. Passport Premiere WARRANTY To April 2021 and Volvo WARRANTY to April 2020. Also equipped with a Painted Blue hull, Watermaker, Crew Cabin, Hydraulic Lift and Williams 325 Jet Tender. Her seasoned owner moved up from a smaller vessel into this beautiful painted blue hull 54 Fly and now ready for the next step up. Professionally maintained and a very clean vessel throughout. Only 315 Hours on the Volvo D11 725hp inboards with Joystick docking. Fully stabilized vessel with SeaKeeper Gyro with controls at lower helm and on the bridge helm. Full A/V package with HD7 Sat System, Raymarine Platinum, Water Maker, Crew Quarters upgrade, Wooden floors throughout main deck, all exterior covers and more. Call listing broker for showing and more information. 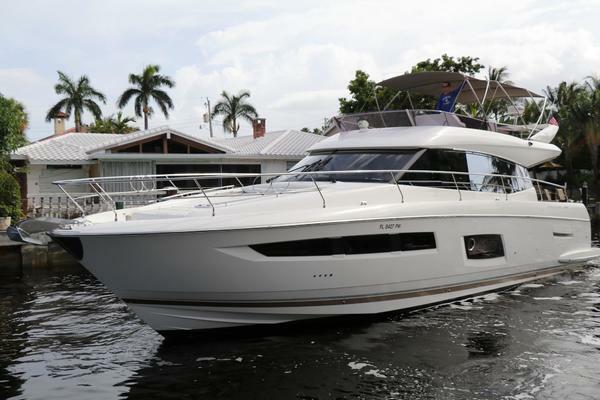 United Yacht Sales New Jersey would love to guide you through a personal showing of this 54' Azimut 54 Flybridge 2016. This yacht for sale is located in Stuart, Florida and priced at $1,269,000. For a showing please contact us by filling out the form on this page and we will get back to you shortly!